The nonautonomous maize Ds transposons can only move in the presence of the autonomous element Ac. They comprise a heterogeneous group that share 11-bp terminal inverted repeats (TIRs) and some subterminal repeats, but vary greatly in size and composition. Three classes of Ds elements can cause mutations: Ds-del, internal deletions of the 4.6-kb Ac element; Ds1, ~400-bp in size and sharing little homology with Ac, and Ds2, variably-sized elements containing about 0.5 kb from the Ac termini and unrelated internal sequences. Here, we analyze the entire complement of Ds-related sequences in the genome of the inbred B73 and ask whether additional classes of Ds-like (Ds-l) elements, not uncovered genetically, are mobilized by Ac. We also compare the makeup of Ds-related sequences in two maize inbreds of different origin. We found 903 elements with 11-bp Ac/Ds TIRs flanked by 8-bp target site duplications. Three resemble Ac, but carry small rearrangements. The others are much shorter, once extraneous insertions are removed. There are 331 Ds1 and 39 Ds2 elements, many of which are likely mobilized by Ac, and two novel classes of Ds-l elements. Ds-l3 elements lack subterminal homology with Ac, but carry transposase gene fragments, and represent decaying Ac elements. There are 44 such elements in B73. Ds-l4 elements share little similarity with Ac outside of the 11-bp TIR, have a modal length of ~1 kb, and carry filler DNA which, in a few cases, could be matched to gene fragments. Most Ds-related elements in B73 (486/903) fall in this class. None of the Ds-l elements tested responded to Ac. Only half of Ds insertion sites examined are shared between the inbreds B73 and W22. The majority of Ds-related sequences in maize correspond to Ds-l elements that do not transpose in the presence of Ac. Unlike actively transposing elements, many Ds-l elements are inserted in repetitive DNA, where they probably become methylated and begin to decay. The filler DNA present in most elements is occasionally captured from genes, a rare feature in transposons of the hAT superfamily to which Ds belongs. Maize inbreds of different origin are highly polymorphic in their DNA transposon makeup. The first transposable element discovered by McClintock  was Ds (Dissociation). Ds could break chromosomes at its site of insertion and could move in response to another factor, which she named Ac (Activator) and showed to be self-mobilizing or autonomous . Shortly after this discovery, McClintock established that there were two types of Ac-responsive Ds elements: those that caused chromosome breaks at high frequency and those that did not. She named the former state I Ds and the latter, state II Ds. Thus, early on, it became clear that Ds elements could differ genetically. Yet, a common origin for these elements was suggested by the observation that state I elements could change to state II. How heterogeneous Ds elements are only became clear after Ac and Ds were isolated and characterized molecularly [4–6]. The 4.6-kb autonomous Ac element makes a single 3.8-kb transcript that spans most of the element's length and encodes an 807-amino acid putative transposase . It causes an 8-bp target site duplication (TSD), ends in 11-bp terminal inverted repeats (TIRs), and contains, within the terminal 200 bp at either end, multiple copies of a hexameric repeat to which the Ac transposase binds . Ds elements share TIRs with Ac and also cause 8-bp duplications of the target site. Three very different kinds of Ds elements can transpose and cause mutations in response to Ac. Ds-del elements are simple internal deletion derivatives of Ac found predominantly in genetic stocks that recently carried an active Ac[4, 9, 10]. Ds1 elements are short (~400 bp) and share with Ac only the 11 bp TIRs and a few of the subterminal hexameric repeats . Ds2 elements are > 1 kb in length and share extensive sequence homology with Ac in the terminal 200 bp at either end . In many Ds2 elements, a large part of Ac's internal sequence has been replaced with an unrelated or "filler" sequence. The ability of Ds elements to cause chromosome breaks turned out to be a function of their structure: all chromosome breakers have multiple transposon ends [5, 13, 14]. Ac and genetically defined Ds elements transpose preferentially into unique or low-copy sequences and largely avoid the repetitive DNA that makes up the bulk of the maize genome [15, 16]. Therefore, these elements are highly efficient insertion mutagens. Ac is absent from most maize lines or populations and present in usually one copy in lines with Ac activity. In contrast, many Ds- hybridizing sequences are present in the genomes of all lines examined , but there has not been yet a concerted effort to characterize all the sequences related to Ds in the maize genome. To that end, we created a heuristic searching algorithm based on the sequence of the Ac/Ds TIRs and the size of the TSD and ran it through the maize pseudomolecules. Each Ds-related element identified via this search was individually numbered, annotated, and had its insertion site categorized according to uniqueness and content in the B73 maize genome sequence . A total of 903 elements with Ds sequence features were located within the B73 genome. A minority resembled previously described elements: there are 331 Ds1 and 39 Ds2 elements, most of which are probably mobilized by Ac. In addition, two new classes of Ds-like (Ds-l) elements were identified. Ds-l3 elements lack extensive subterminal homology with Ac, but carry fragments from various parts of the Ac transposase gene. There are 44 such elements in B73. Ds-l4 elements share little similarity with Ac outside of the 11-bp TIR and have a modal length of ~1 kb. The majority of Ds-related elements in B73 (486/903) fall in this class. None of the Ds-l elements tested were excised by Ac. Unlike Ac and recently transposed Ds elements, about half of the Ds-related elements identified in this study had inserted in repetitive DNA. Conversely, repetitive sequences, such as long terminal repeat (LTR) retrotransposons, were found within some Ds-l elements. Some elements carried gene fragments, a rare feature of transposons of the hAT superfamily to which Ds belongs, though a common feature of other transposons. Lastly, only half of Ds insertion sites examined were shared between the inbreds B73 and W22, indicating that the makeup of DNA transposons will vary greatly among inbreds of unrelated origin. The 11-bp terminal inverted repeats (TIR) are specific sequences that define the 5' end (C/TAGGGATGAAA) and 3' end (TTTCATCCCTA) of each Ac/Ds element and play a key role in transposition [19–22]. The other identifying trait of an Ac/Ds element is the target site duplication (TSD). Not part of the transposon, the TSD is a direct repeat of the same 8 base pairs upstream and downstream of the TIR. Unlike the 11-bp TIR, the 8-bp TSD is not a specific sequence. Rather, because it is the site where the Ds element inserted into the genome, the TSD can be almost any combination of 8 bp. Based on the sequence characteristics of Ac and Ds elements, we developed a data mining algorithm, written in PERL, to search through the maize pseudomolecules for Ds sequences and found sequences with perfect TIRs and identical TSD sequences and with TIRs and TSD sequences differing by up to 2 bp. The algorithm generated putative Ds elements and identified the position of their TSD in the genome. Putative Ds elements were then used to BLAST-search the maize genome database for related Ds sequences in which the TIRs or TSDs differed by more than 2 bp. Because known Ds1 elements are smaller than 500 bp and Ds2 elements are larger than 1 kb, all elements were first separated by length into groups of elements measuring < 500 bp, 500 to 1000 bp, 1000 to 5000 bp, and > 5000 bp. Then, elements were located in the maize genome via BLAST, and redundant sequences were eliminated. Each sequence was then compared to known Ds1 and Ds2 elements using BLAST2, and categorized based on those results. The nature of the target sites was determined by a series of tests, including presence of start and stop codons, presence of untranslated region sequences, EST (expressed sequence tag) support, and presence of corresponding mRNA in GenBank. Prior annotation of the predicted Ds elements and of the genome sequences 200 bp upstream and downstream from the element's insertion site were checked in the database at maizesequence.org. The 200 bp flanking each element were analyzed for uniqueness using BLAST, maizesequence.org, and RepeatMasker http://www.repeatmasker.org/. The 200-bp subterminal regions within each sequence were examined for the AAACGG 6-bp hexamer repeats which bind the Ac transposase . Only three copies of these hexamers in the 5' end have been shown to be required for transposition . The B73 stock used in the Ds mobility assay was obtained from the USDA North Central Region Plant Introduction Station at Ames, IA (PI-550473). The W22 stocks used were: the standard Wx version and a version carrying wx-m7(Ac), an unstable wx allele described by McClintock . This allele arose by insertion of the 4.6-kb Ac element in the 5' untranslated region of the Wx gene [20, 25]. Activation of Ds excision by Ac was monitored by PCR in an F1 between B73 and the W22 stock carrying wx-m7(Ac). DNA was extracted from young seedling leaves and PCR reactions were run as described . PCR primers were designed based on the 500 bp sequences flanking each Ds element end. All primer sequences are listed in Additional File 1, Table S1. Physically sheared W22 DNA was size-fractionated by agarose gel electrophoresis to a 300- to 500-bp size range. Sheared DNA ends were blunt-ended and kinased with an Epicentre End-It DNA end repairing kit and adaptors were ligated with T4 DNA ligase. PCR amplifications were carried out with an adaptor primer and primers ending in the Ac/Ds TIRs. PCR products were cloned into pGEM-T easy vector and sequenced in a 3730 DNA analyzer. Ds1 elements are short, less than 500 bp in length, and share little sequence in common with Ac, other than the 11-bp TIRs and a few copies of the AAACGG hexameric repeat found in the Ac subterminal regions (Figure 1). They were first detected in unstable mutations [6, 27, 28] and are known to occur in at least 50 copies in the genomes of all maize lines . In contrast, Ds2 elements are much closer to Ac, sharing with Ac the ~200 bp subterminal regions (STR) and variable stretches of internal sequence, and appear to have originated from Ac by deletion (Figure 1). Most carry, in addition, "filler" sequence from other parts of the genome [30, 31]. They have been estimated to occur in about a dozen copies and, like Ds1, have been found in several unstable mutations. Structure of different types of Ds elements compared with Ac. Ac is 4565-bp long and encodes a 5-exon transposase. Ds1 elements are the shortest and share little in common with Ac. Ds2 elements have ~200 bp of the Ac subterminal region at each end. Ds-l3 elements carry sequences corresponding to parts of exons 2 and 3 of the Ac transposase and are the longest Ds elements, on average. Ds-l4 elements have a modal length of about 1 kb and share with Ac only about 30 bp at either end. In addition to the previously described Ds1 and Ds2 element classes, we have identified a large number of elements that, though containing the hallmark Ac/Ds TIRs and flanking an 8-bp duplication, do not match any previously described Ds sequences. They lack obvious homology to Ac in the terminal 200 bp sequences and may not be mobilized by Ac, so we have referred to them as Ds-like (Ds-l) elements. Ds-l elements can be divided into two groups, Ds-l3 and Ds-l4. Ds-l3 elements have an average length of 4 kb and retain parts of exons 2 and 3 of the Ac transposase (Figure 1). Ds-l4 elements are on average about 1 kb long and, though very numerous and variable in sequence, do not differ much in size. The homology between Ds-l4 and Ac is restricted to little more than 30 bp on the 5' and 3' ends (Figure 1). The chromosomal distribution of all 903 Ds-related elements in B73 is shown in Table 1. There are 331 Ds1, 39 Ds2, 44 Ds-l3, and 486 Ds-l4 elements in the B73 genome (Additional File 1, Tables S2-S5). 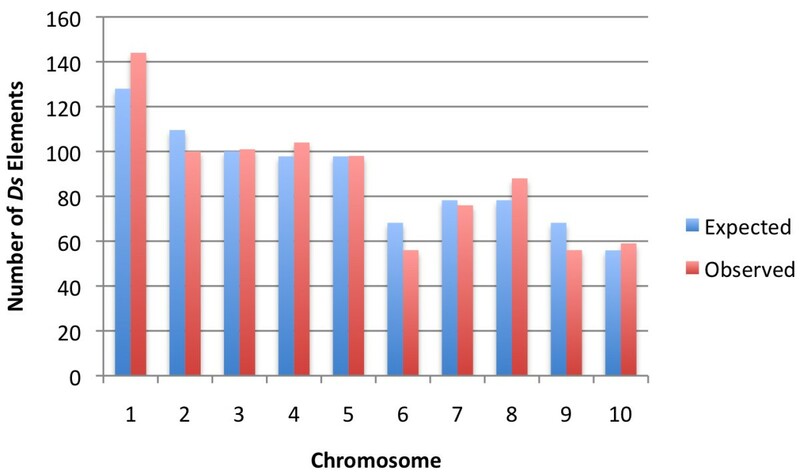 A χ2 test showed no significant difference between the observed distribution of Ds- related elements per chromosome and the expected distribution based on chromosome length in the 10 chromosomes of B73 (Figure 2). Distribution of Ds elements in the 10 chromosomes of B73. The observed distributions are not significantly different from those expected based on the length of the 10 chromosomes (χ2 = 9.05, 9 df, 0.5 > P > 0.3). Three elements, classified here as Ac-like elements, share a large amount of similarity with Ac, save for small indels. A similar element called Ac-cryptic has been described previously . As anticipated from its history , the B73 genome contains no simple deletion derivatives of Ac. More than 90% of Ds-related elements in the genome fall either in the Ds1 or Ds-l4 classes. Ds1 elements were known to be numerous based on earlier hybridization data , but their copy number had been estimated to be around 50, so the present analysis of the maize genome sequence pushes up their number at least sixfold. Of the 331 Ds1 elements in B73, 184 were identified as such by the maize sequencing effort (maizesequence.org), 4 were incompletely annotated, and 143 were missed (Table 2). All 39 Ds2 elements identified here had variable filler sequences unrelated to Ac. Of the 39, only 2 were fully annotated as Ds sequences in the maizesequence.org database, 26 were partially annotated, and 11 were missed. We searched the B73 genome for the specific Ds2 elements previously isolated from unstable mutations and found that the element in wx-B4 was present in two copies (Ds2-2 and Ds2-15 in Additional File 1, Table S3), but those in adh1-2F11 or sh2-m1 were absent. None of the Ds-l elements was annotated as a full Ds element in maizesequence.org. Among the 44 Ds-l3 elements, 42 were partially annotated as Ds and 2 are new. Notably, of the 486 Ds-l4 elements, only 62 had been partially annotated as Ds elements, while the remaining 424 had been missed. Despite their dissimilarities with the Ac sequence, the Ds-l4 elements themselves are related to each other. A Jalview phylogram [35, 36] shows that Ds-l4 elements fall into 3 main clusters, after excluding from the alignment the 30 elements that are larger than 5 kb (Additional File 2, Figure S1). The Ds-l4 elements in each cluster have a high degree of similarity throughout. Cluster 1 (top part of the phylogenetic tree) contains 57 elements, cluster 2 (middle of the phylogenetic tree) contains 339 elements, and cluster 3 (bottom of the phylogenetic tree) contains 60 elements. Ds1 and Ds2 sequences have been shown to cause mutations when they insert into genes [6, 12, 30, 31, 37–39], so it is not surprising that several Ds and Ds-l sequences were found in or near genes. As shown in Table 3, 37 Ds1 (11%), 5 Ds2 (13%), 2 Ds-l3 (5%), and 34 Ds-l4 (7%) elements had inserted in or within 200 bp of a gene model. Given the propensity for Ac and Ds to insert into or near genes, it was surprising that relatively few Ds elements mapped into or near genes in B73. It would appear, then, that somewhat lower percentages of Ds-l than Ds elements are found near genes. Similarly, slightly higher percentages of Ds-l elements are inserted in repetitive or intergenic low-copy DNA (49.8% vs. 41.5%, respectively). Overall higher percentages of Ds-related elements are found in repetitive DNA sequences than would have been expected from prior genetic analyses of recently transposed Ac or Ds elements in maize [15, 16]. Although transposons from other superfamilies, such as MULEs , CACTA , and Helitrons[42, 43], can take up gene fragments, this property has not been reported for members of the hAT superfamily, to which Ds belongs . In this study, we have identified both Ds2 and Ds-l4 elements that carry gene fragments (Figure 3). DNA sequences inserted within Ds elements. The sequences can originate from genes, LTR retrotransposons, other DNA transposons, or intergenic DNA. Two Ds2 elements appear to have captured gene fragments. Ds2-22 carries exons 5 and 6 and the intervening intron from an IAA amino acid hydrolase ILR1-like3 gene. This gene fragment appears to have been copied from its original location on chromosome 2 onto Ds2-22, which resides on chromosome 9 of B73 (Figure 4). The sequence carried in the Ds2-18 element is annotated as a complete gene encoding hypothetical protein LOC100383699. This annotation is supported by EST and mRNA evidence. However, all copies of this coding sequence are transposon-borne in B73, raising doubts as to the functional significance of the transcript in the sequence database. Genic DNA capture by Ds elements. Ds2-22 and Ds-l4-354 are located on chromosomes 9 and 8, and their inserted gene fragments, containing intron sequences, are from chromosome 2 and 9, respectively. 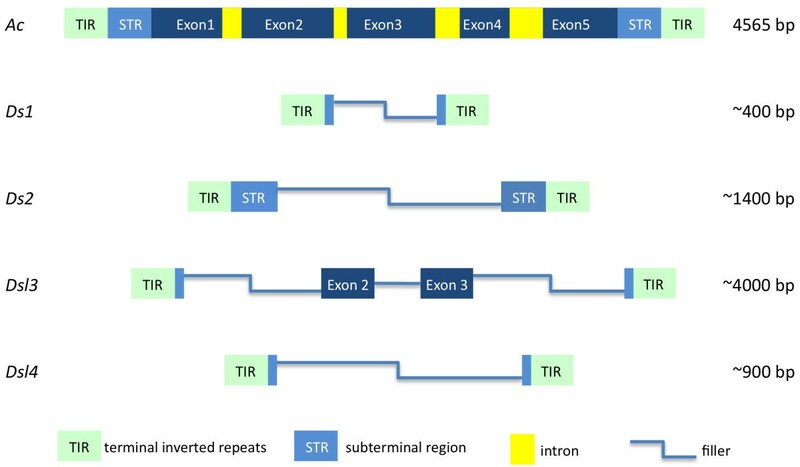 Exons are diagrammed in green or orange, introns in yellow, and Ds transposon sequences in blue. Similarly, some Ds-l4 elements appear to have captured gene fragments. Ds-l4-354, which resides on chromosome 8 of B73, carries a fragment of the ZmMybst1 gene, which is located on chromosome 9 (Figure 4). The 7344-bp Ds-l4-483 element on chromosome 10 is an example of a compound Ds-l4 element that has trapped extraneous sequences between its termini (Figure 5). Bases 1-987 of Ds-l4-483 correspond to a regular Ds-l4 element with perfect TIRs flanked by a TSD. Directly following this are: a fragment of an LTR-retrotransposon polyprotein (988 to 1650), a transcribed sequence from chromosome 5 (1651 to 6537), and a duplicate, but truncated, copy of the first Ds-l4 in this compound element, ending in a perfect TIR and an additional copy of the TSD (6538 to 7344). Compound Ds-l4 element with trapped extraneous sequences between its termini. The Ds-l4-483 element on chromosome 10 is 7344-bp in length. Bases 1-987 of Ds-l4-483 correspond to a regular Ds-l4 element with perfect TIRs flanked by a TSD. Following this are a fragment of an LTR-retrotransposon polyprotein (988 to 1650), a transcribed sequence from chromosome 5 (1651 to 6537), and a duplicate, but truncated, copy of the first Ds-l4 in this compound element, ending in a perfect TIR and an additional copy of the TSD (6538 to 7344). Two additional sets of transcribed sequences, found in the GenBank mRNA database, are carried by repetitive Ds-l4 elements. Ds-l4-93, Ds-l4-135, Ds-l4-307, and Ds-l4-343 contain the two putative exons of Zea mays clone 1443778 mRNA and Ds-l4-244, Ds-l4-275, and Ds-l4-368 contain the two putative exons of Zea mays clone 1451145 mRNA. The introns separating these exons in the elements end in canonical GT-AG. Neither mRNA encodes a protein with a homolog in the sequence databases, so again, it is conceivable that the only copies of the transcribed sequences in the genome are those carried in the transposons. Nevertheless, the presence in different chromosomes of multiple copies of two sets of two Ds-l4 elements with almost identical transcribed sequences suggests that these elements transposed in the recent past, after acquisition of the sequences. Large insertions were found in all Ds element classes (Figure 3). Not surprisingly, the majority were LTR retrotransposons, which constitute the bulk of the maize genome . Ten Ds1 elements were much longer than average, measuring between 0.8 and 24 kb. 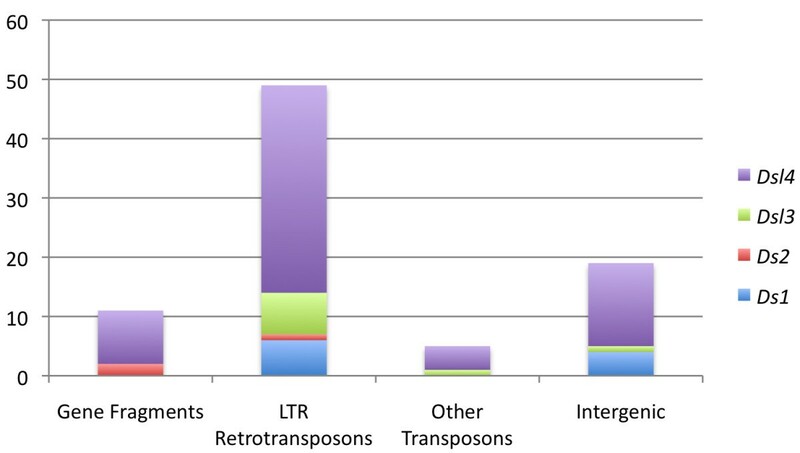 LTR retrotransposons were inserted in six of them (Additional File 1, Table S2). Although the average length of Ds2 elements was approximately 1.4 kb, some, such as Ds2-13, were as long as 12.7 kb as a result of LTR retrotransposon insertions (Additional File 1, Table S3). 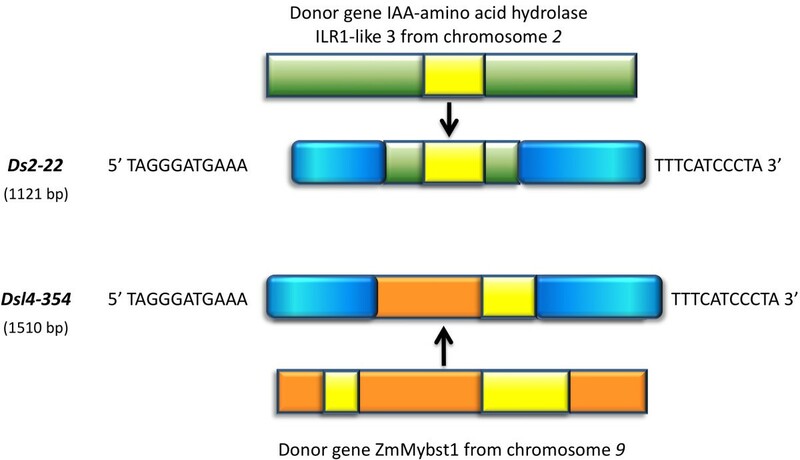 Similarly, LTR retrotransposons were inserted in 7 Ds-l3 and 35 Ds-l4 elements (Additional File 1, Tables S4 and S5). Though less numerous, DNA transposons were also found inside of Ds elements. For example, a Ds-l4 element was nested inside of Ds-l3-15. This nesting pattern is common for LTR retrotransposons , but rarer for Ds transposon types, probably because nested Ds elements acquire chromosome-breaking properties  and would be selected against. In agreement, no chromosome-breaking double Ds was detected in B73. In addition to transposons, intergenic sequences without obvious transposons properties could be found inside of Ds elements. These most likely represent DNA capture events that do not include coding sequences. Intergenic DNA sequences of various lengths were found in 4 Ds1, 1 Ds-l3, and 14 Ds-l4 elements (Additional File 1, Tables S1, S3, and S4). The terminal 200 bp at either end of Ac are required for wild-type levels of transposition . Within these terminal sequences, there are multiple AAACGG repeats that bind to the Ac transposase in a cooperative fashion and are, most likely, the subterminal sequences that impart specificity to the transposition reaction [8, 22, 23]. Only three copies of these hexamers have been shown to be required for transposition . The number of B73 Ds-related elements with 3 or more copies of the subterminal repeat in each class are: 17 of 331 Ds1, all 39 Ds2, 37 of 44 Ds-l3, and 438 of 486 Ds-l4 (Table 4). Thus, the vast majority of Ds2, Ds-l3, and Ds-l4 elements contain 3 or more AAACGG repeats within their subterminal regions, but only a few Ds1 elements do. However, the lack of these hexamers does not preclude transposability, as some Ds1 sequences lack them and are still able to transpose, probably because the transposase can interact with sequences related to, though not identical with, the hexameric repeat . In order to test the mobility of the newly identified Ds-l3, Ds-l4, and control Ds2 elements in response to Ac, we developed the following PCR excision assay. We first identified Ds-l3, Ds-l4, and Ds2 elements in B73 that had inserted in single-copy DNA and were shared with the inbred W22. We then crossed B73 with the W22 genetic stock c wx-m7(Ac) and monitored filial and parental DNAs for the presence of a somatic Ds excision or "empty" site in the F1, but not in B73. Figure 6 shows the PCR results for representative elements. Ds2-21 shows a clear excision band in the F1, whereas Ds2-31 does not (Figure 6A), indicating that the former can transpose in response to Ac, but the latter cannot. An alignment of the 5' and 3' ends of Ds2-21 and Ds2-31 with Ac (Figure 7) reveals that Ds2-31 has undergone a duplication-deletion at the 3' end, which probably interferes with its mobility. On the other hand, none of the shared Ds-l elements tested (Ds-l3-28, Ds-l4-118, Ds-l4-169, Ds-l4-199, Ds-l4-266, Ds-l4-337, and Ds-l4-378) produced an excision band in the F1 (Figure 6B and data not shown). Thus, in spite of possessing subterminal AAACGG hexamers, neither Ds-l3 nor Ds-l4 elements are able to transpose. Possibly, the 5' and 3' ends of Ds-l3 and Ds-l4 elements, as well as of 17 of 39 Ds2 elements (alignment data not shown), are too defective to be mobilized by Ac. PCR assay for Ac -driven excision of Ds2 and Ds-l4 elements. (A) Ds2-21 and Ds2-31 elements. Lanes: 1 and 18, 1-kb ladder; 2 and 10, W22 inbred (Wx); 3 and 11, B73, pooled seedlings; 4 and 12, B73 plant #1; 5 and 13, B73 plant #2; 6 and 14, wx-m7 plant # 1; 7 and 15, wx-m7 plant #2; 8 and 16, F1 (B73-1 × wx-m7-2); 9 and 17, F1 (B73-2 × wx-m7-2). Only the Ac/+ heterozygous F1 individuals (lanes 8-9) showed the band expected from somatic Ds2-21 excision. The absence of that band in the wx-m7(Ac) homozygotes (lanes 6-7) can be attributed to the well-established negative dosage effect of Ac . No somatic excision of Ds2-31 could be detected in the Ac/+ heterozygous F1 individuals (lanes 16-17). (B) Ds-l4-176 and Ds-l4-199 elements. Lanes: 1, B73, plant #1; 2, wx-m7 plant #2; 3, F1 (B73-1 × wx-m7-2); 4, B73, plant #1; 5, wx-m7 plant #2; 6, F1 (B73-1 × wx-m7-2); 7, 100-bp ladder; 8, 1-kb ladder. Ds-l4-176 is polymorphic, i.e., not shared between B73 and W22, and cannot be assayed. No somatic excision of Ds-l4-199 could be detected in the Ac/+ heterozygous F1 individuals (lane 6). Alignment of the 5' and 3' terminal 80 bp from Ac, Ds2-21 , and Ds2-31. All three 5' ends align well, except for two SNPs in Ds2-21. In contrast, the 3'ends of Ac and Ds2-21 align well, but the 3' end of Ds2-31 is interrupted by a duplication and a deletion. The only complete maize genome sequence in the public domain is that of the B73 inbred. This genome is constantly being revised and recompiled, and serves as the de facto maize database for BLAST. The W22 inbred line is being utilized in genetic studies aimed at developing Ac/Ds transposon tagging resources [15, 16], so knowledge of the full complement of Ds- related elements in W22 would be valuable. In the course of this study, we found that 9 of 18 Ds or Ds-l elements present in B73 were absent in W22 (e.g., Ds-l4-176 in Figure 6B), which precluded a PCR test for excision in the F1. To estimate the fraction of Ds insertion sites in W22 that are not shared with B73, we proceeded to isolate Ds 5' junction sequences in W22 by a modified transposon display procedure, sequenced a set of random clones, identified 25 different junctions, and BLASTed them against the B73 genome. Only 13 matched Ds insertion sites in B73, (e.g., Ds1-208, Ds2-35, Ds-l3-21, Ds-l4-61, Ds-l4-169, and Ds-l4-346). Although only a small sample of Ds sites was analyzed, it is clear that a sizable fraction of Ds element insertion sites are polymorphic between these two inbred lines. We report here a comprehensive analysis of Ds and Ds-like elements in the genome of B73, a maize inbred that lacks Ac activity (Additional File 1, Tables S2-S5). Two novel classes of Ds-like elements, Ds-l3 and Ds-l4, were identified in this study. Although they share TIR sequences with Ac, Ds-l3 elements differ greatly from Ac in the subterminal regions. Most Ds-l3 elements contain sequences from exons 2 and 3, the two largest exons of the 807-amino acid Ac transposase, but lack the C terminus, which is highly conserved among hAT elements and correlates with transposase activity . The Ac-matching areas of these Ds-l3 elements have been incorrectly annotated as belonging to Ac elements in the maizesequence.org database. Ds-l4 elements have the least in common with Ac, just 30 bp at either end, which explains why they had escaped detection until the present work, even though they comprise the majority of Ds-related sequences in the genome (54%). Ds1 elements, an established mobile clade within the Ac/Ds family, also share little in common with Ac beyond their TIR sequences. The main differences between Ds-l4 and Ds1 sequences are: their length, the former being about twice as large; the fraction of elements with 3 or more copies of the AAACGG subterminal repeat (438/486 vs. 17/331, respectively), and the nature of the non-Ac filler sequence. Ds1 elements share a common filler which exhibits minimal sequence variation . Ds-l4 elements, on the other hand, have variable filler sequences, although their phylogenetic analysis reveals clusters of related elements (Additional File 2, Figure S1). The high copy number and high degree of similarity of the filler sequences in each cluster make it difficult to identify the original source of these sequences in the genome. Our algorithm provided for up to 2-bp variation in either the element's TIR or the host TSD. To determine if the algorithm had missed any elements not flanked by a TSD, which is dispensable for transposition [49, 50], we removed the TSD requirement from our script. The new search produced only 11 additional putative elements, with flanking host sequence identity ranging from 1 in 8 to 5 in 8. There were 3 Ds1, 1 Ds2, 2 Dsl3, and 5 not clearly related to any of the classes identified in this study. The ends of these 5 elements are well conserved, so probably all of them represent Ds elements at various stages of decay. This exercise suggests that we have essentially defined the entire Ac-Ds family in maize. The hexameric repeat sequence AAACGG located in the STR of Ac is necessary for transposition [8, 22]. All Ds2, 37 Ds-l3, and 438 Ds-l4 elements possessed hexamers in numbers judged sufficient for transposition . However, none of the Ds-l elements tested by our PCR assay showed evidence of somatic excision in the presence of Ac, whereas the tested Ds2 elements did. The most likely explanation for this negative result is that the 5' and 3' ends of Ds-l3 and Ds-l4 elements are too defective to be mobilized by Ac. Alternatively, these elements may reside in hypermethylated DNA, which has been shown to inhibit Ac transposition . The methylation status of Ds sequences was not analyzed, as this was beyond the scope of the present study. Multiple copies of the hexameric repeat may not be the key requirement for Ds1 mobility because some known mobile Ds1 elements contain just one copy of the repeat [11, 27]. Of the 331 Ds1 elements in the B73 genome, 314 lack them. Kunze and Starlinger  have emphasized that the lack of these hexamers does not exclude an element from being able to transpose. Ds1 elements are presumed to be transposable because other subterminal sequences may also interact with the transposase complex. The occurrence of LTR retrotransposon sequences in Ds and Ds-like elements is not surprising because these sequences constitute more than three quarters of the maize genome . An answer to the question of whether or not their increased size renders these elements nontransposable can be sought in the existing literature. There are several examples of Ds elements with large, unrelated stretches of DNA that can still transpose, provided an Ac element is present in the genome [52–54]. More recently, a macrotransposon with a Ds element at one end and an Ac element at the other was shown to mobilize as much as 100 kb of intervening DNA consisting mostly of nested retrotransposons . Thus, it is unlikely that increased size alone makes Ds-l elements incapable of tranposition. Several different types of DNA transposons, including the recently discovered Helitrons, are known to pick up fragments of genes from the genome. However, there are no reports of gene fragment capture by hAT elements in the literature. Here, we identified 2 Ds2 and 9 Ds-l4 elements containing gene fragments. How excisive DNA transposons acquire gene fragments is not known, but it has been suggested that host sequence capture may result from DNA replication errors during repair of the double strand breaks caused by transposon excision . The notion that gene capture proceeds via genomic DNA, as in all other DNA transposons, is supported by the two cases of Ds2 elements with trapped gene sequences. In the Ds2-22 element, which carries a fragment of an IAA amino acid hydrolase ILR1-like 3 gene, the intron sequence between exons 5 and 6 is present, arguing against capture from an mRNA. Ds2-22 is on chromosome 9, whereas the donor gene is on chromosome 2 (Figure 4.). The second Ds2 element is more intriguing. A homologous transcript of unknown function, with putative start and stop codons, can be found in the maize mRNA sequence database. Ds-l4 elements can also carry database-supported, transcribed genomic sequences containing introns. For some of them, the donor gene can be identified. An example of a captured sequence from a known gene is provided by Ds-l4-354, with the element on chromosome 8 and the donor gene on chromosome 9 (Figure 4). However, putative donor gene sequences for other fragments could not be found in the current version of the B73 genome, suggesting that the corresponding Ds-l4 transcripts in the databases may represent nonfunctional transcriptional baggage. The Ds content of the inbred W22, used in its wx-m7 version as the Ac source for the Ds-l4 excision assay, was surveyed in this study. Of 25 Ds or Ds-l junctions isolated from W22, only one-half (13) were shared by B73. Though these two inbreds fall into different heterotic groups , they represent germplasm adapted to the U.S. Corn Belt. We infer that, as has been found for retrotransposons , the content of most DNA transposons will be highly polymorphic among maize lines. We can also compare the distribution of Ds elements accumulated over time in B73 with that of recently transposed Ds elements in W22, the inbred used by Vollbrecht et al. in their studies. Additional File 3, Figure S2 shows the distribution of Ds elements in each pseudomolecule of the B73 genome. While a statistical comparison is unwarranted because of the smaller number of elements in our study (no chromosomal region has ≥10 insertions), a visual comparison reveals similar trends: low concentration of elements in the centromeric regions and high concentration of elements in the distal tips of some arms. particularly 1L, 2S, 5L, 7L, and 8L. Transposons, recognized today as ubiquitous components of eukaryotic genomes, were first identified six decades ago by their disruption of chromosomal integrity and their mutagenic effects on genes. The elegant genetic analysis of gene mutations that served as reporters for their movement served to elucidate many transposon properties, but the complexity of transposon families has only been revealed by whole genome sequencing projects. Here we report on an in-depth analysis of all the sequences in the maize genome that are related to Dissociation (Ds), the first transposon ever described. Our bioinformatic approach has uncovered over 900 Ds-related sequences, including two novel classes that account for the majority of elements in the family. These novel elements have diverged significantly from Ds and, though clearly related to Ds, do not appear to transpose in today's maize genome. Unlike actively transposing elements, many of the Ds-related elements are inserted in repetitive DNA, where they probably become immobile and begin to decay. A second maize inbred line shared only half of its Ds insertion sites with B73, suggesting that present-day maize inbred lines differ greatly in their DNA transposon make-up. We thank Randy Kerstetter for suggesting the modified transposon display procedure to characterize Ds insertion sites in W22 and Yubin Li, Qinghua Wang, and Jun Huang for valuable comments on the manuscript. Part of this work is from an MS thesis submitted by A.H. to the Montclair State University Graduate School. Part of this work was supported by National Science Foundation Plant Genome Program project DBI-0929350 to HKD and CD. Conceived and designed the experiments: CD and HKD. Performed the experiments: AH, LH, JC. Analyzed the data: CD, AH, LH, JC, HKD. Wrote the paper: CD and HKD. All authors read and approved the final manuscript.